15 best Christmas beauty gift pack ideas for him and her. The 16 best gift packs for her (and him) that give you serious bang for your buck. For beauty lovers, one of the best parts of Christmas is the gift sets. It’s a time where classic products and new products live together in some sort of delightful cosmetics bag, ready to live a glamorous life on your bathroom shelf. Plus, there are major savings to be had. We’ve rounded up the 16 best gift packs for her (and a few for him) that give you serious bang for your buck. If you’re someone who likes to get your money’s worth, look no further. 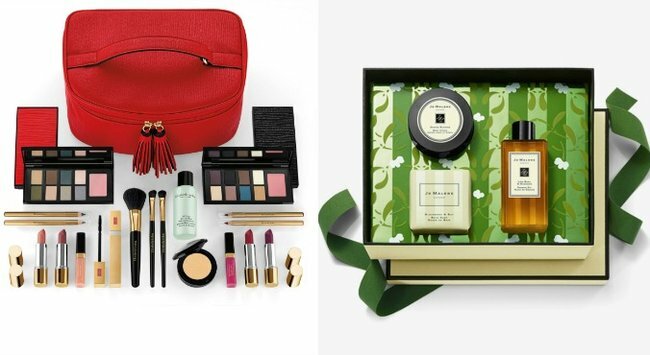 With a whopping value of $585, the Elizabeth Arden Christmas Colour Blockbuster ($99) is a treasure chest of amazing products including everything from brushes and eyeshadow palettes to lipstick, all encased in a vibrant red vanity bag. Napoleon Perdis has some killer gift sets this year at a great price point. Our pick? The Party Ready Love! Collection ($59) which has everything you need for to create the ultimate party look, including their bestselling primer. With delicious scents of black peppercorn, silver birch and bushukan, the Molton Brown Bath & Shower Gel Christmas Set for Him ($99) is a luxurious treat to spoil a man in your life. If we&apos;re being honest, we kind of want one for ourselves too. Give the gift of fab hair this tear with the Deluxe Dry and Curl Wand Set ($350). Including a hair dryer, curling wand and heat-proof mat, it almost guarantees a good hair day, every day. Forgo the traditional cologne and go personal with the men&apos;s Malin + Goetz Perfume Oil Set ($205). Featuring three rollerball scents, the limited edition set allows you to wear alone or mix and match to create your signature fragrance. The Jo Malone Bath and Body Collection ($95) is a beautifully looking and smelling luxurious collection of bathroom favourites. A favourite across multiple generations, Clinique Skincare Greats ($90) is a bumper bag of classic and beloved products essential to any skincare routine. The Estee Lauder All Night Glamour Set ($95) gives the ultimate glamorous makeup look at your fingertips and we don&apos;t mind the killer clutch it comes with too. The Uppercut Deluxe Filled Washbag ($79) is a seriously stylishly grooming kit for him. Not only does the Ultraceuticals x Lust List Mattifying Collection ($109, available at David Jones) contain beauty insiders&apos; favourite products, it also comes in a beautiful keepsake box. For fans of the brand or those who have been eyeing it up of late, consider this Kat Von D Mi Vida Loca Remiz Studded Lipstick Set ($62, available at Sephora) a &apos;tasting plate&apos; of mini vibrant lippies that will make the perfect gift. The Mecca Edit The Es-Scent-tials ($125) is an iconic, hand-picked collection of the best selling scented products that we&apos;d love to find under our tree. If you&apos;re looking for something luxurious, look no further than the Elemis Pro-Collagen Super System 30 days ($350). It&apos;s a salon quality professional rejuvenating facial and skincare regimen in a beautifully wrapped box. There are few things prettier than this Juicy Couture Deluxe Mini Coffret ($49, available at Myer). The Jurlique Iconic Collection ($119) is a fantastic collection of calming and soothing favourites. Natio Well-Kept secret ($49) is the perfect bathroom or gym bag essential for the well-kept man. Which gift sets are on your list this year?